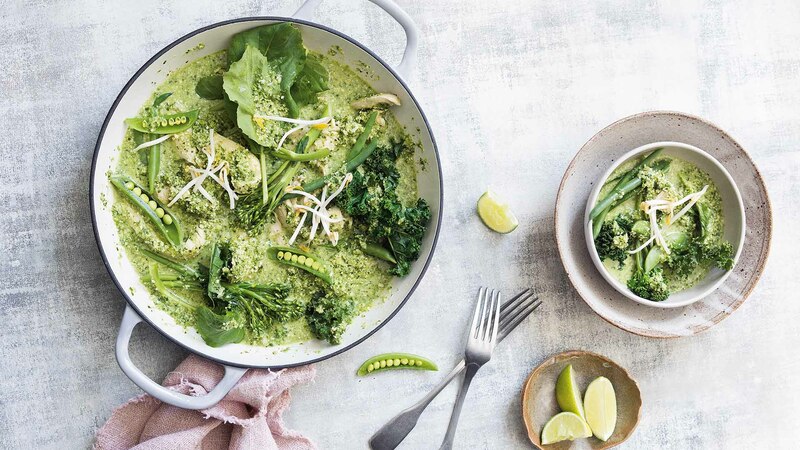 A nourishing curry, full of the goodness of green vegetables and a homemade macadamia curry paste. 1. To make the curry paste, place all the ingredients and ¹⁄³ cup (80 ml) water in a food processor and process until a paste forms. Set aside until required. 2. Heat the rice bran oil in a large wok over high heat, add the chicken and stir-fry for 3 minutes. Add the curry paste and stir-fry for 1 minute or until fragrant. Add the beans and broccolini and cook, tossing, for 3 minutes or until almost tender. Add the sugar snap peas, Chinese broccoli, kale and stock and stir-fry for 3 minutes or until the leaves have wilted and the sauce has reduced by one-third. Season to taste with freshly ground black pepper. 3. Serve the curry topped with the bean sprouts, with lime wedges on the side. Tip: Make it a vegetarian curry by swapping the chicken for the same quantity of diced firm tofu and replacing the chicken stock with vegetable stock. Recipe extracted from CSIRO Low-Carb Every Day by Professor Grant Brinkworth and Pennie Taylor. Available now, Macmillan Australia, RRP $34.99. Professor Grant Brinkworth is a principal research scientist at CSIRO Health and Biosecurity. Pennie Taylor is the senior research dietitian at CSIRO Health and Biosecurity.